THE EMERALD FOREST came out in 1985, garnered positive reviews and good grosses. 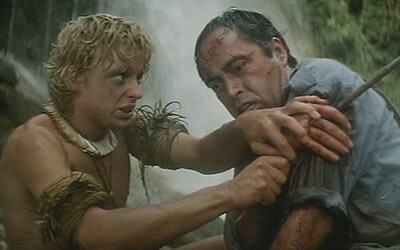 Director John Boorman worked from Rospo Pallenberg’s script, inspired by an actual event where a Peruvian engineer searched Amazonian jungle for ten years looking for his young son, kidnapped by an Indian tribe. Changing the protagonist to an American, filming in many locations around Brazil, Boorman crafted a gripping adventure saga that’s basically timeless with an environmental message that, frighteningly, is still flashing—now way past alarm stage—the devastation of the Rain Forest/s. Part of that crime involves the exploitation of the indigenous people who reside in those amazing natural realms, and the movie makes their plight register. Lensed by Philippe Rousselot, it’s gorgeous to look at, like other Boorman work (Deliverance, Excalibur), and is graced with an evocative score from Brian Gascoigne and Junior Homrich . Powers Boothe is a sturdy lead as the searching father. Tough-looking, but intelligent and thoughtful, it’s nice to see him play a good guy. Boorman made a smart choice picking his 18-year-old son Charley for the role of the son, raised in the tribe and caught between worlds. Meg Foster (she of the strange eyes) is the mother, and other roles are filled by Dira Paes, Ruy Polanah, and Eduardo Conde (who has an unfortunate dinner date with ‘The Fierce People’). Really challenging physical work all around. Scenery, action, trauma, revenge-worthy villains, hallucinogens, spiritual fireworks, emotional payoff. 110 minutes worth repeated viewing. Hard to fathom that the colossal havoc wreaked on the forests has not ceased. How much has gone under since this flag was waved? We’ll all pay.